Mickey Mouse Minnie Monsters, Inc.
AmEx is no longer the official card for Disney packages. The White Glove Treatment program ended. The Disney World/American Express relationship ended Dec 31, 2002. That could be considered the retirement date of the pin. Disney Visa Card Day 1 pin to be given with first purchase made on the Disney Visa Card for all members that signed up to get the card first. Cards eligible to get the pin will have "Day 1" printed in the "Member Since" area. It is a red credit card-like pin with colorful confetti streamers all over it and reads Day 1 2003 Disney Visa Card. Behind it is a black Mickey head in the corner. Disney Trading Pin Mickey and Friends Puzzle Pin - Minnie Mouse. This pin features a Minnie Mouse cupcake. The cupcake has a yellow wrapper. The icing is red with white sprinkles with a a bow on the top of the cupcake. This is the Butler Robot pin from the Past Attractions collection of 2010 Hidden Mickey Pins at WDW. This pin commemorates Horizons. This pin will only be available by trading with a cast member. This open stock rack pin released at Disneyland and WDW Resorts. It features a classic Minnie Mouse with a white face standing in a polka dot dress with pink shoes. Her hat has a flower. Cutie Dale is looking as cute as can be in this Open Edition pin. This pin features a full body image of Dale and measures approximately 1" tall. This open edition pin features the Muppets Miss Piggy on a Vinylmation™ form. Disney Trading Pin 78306 Vinylmation Collectors Set - Muppets Waldorf This open edition pin features the Muppets Waldorf on a Vinylmation™ form. The Pin is mostly square with a Blue border or frame around the outside. Donald is featured showing his pride (proud)with both his thumbs inside his shirt by his chest, hands facing out. The background is Yellow with Red Anchors. Donald is wearing a blue sailor suit and hat, along with a red bow tie. The Pin is mostly square with a Yellow border or frame around the outside. Tinker Bell is featured with her left arm and hand near her face. The background is Purple with Yellow Stars. Tinker Bell is wearing a green outfit with blonde (yellow) hair and lite blue wings. The Pin is mostly square with a dark Blue (Almost black) border or frame around the outside. Stitch is featured with both his hands up by his face, claws showing. The background is Blue with green Blots (Bloches or splashes). Stitch has a dark blue nose, blue eyes, purple body and pink ears. This pin features Dale the chipmunk at The Enchanted Tiki Room in Adventureland. Dale is upsidedown, standing on his head. Tinker Bell, is flying to the right over Sleeping Beauty's pink and light blue castle while wearing a pair of black mickey ears. Multi-Colored fireworks are around her in: red/orange/yellow,dark green/light green/yellow, & red/orange. The cloud at the base of the pin reads "Disneyland Resort" there are 3 small stars. Disney Hollywood Studios' "Toy Story Mania" attraction closing scene gives 'prizes'. Fawn is posing in her orange and brown autumn attire. She is standing in front of a light peach background with an orange leaf and a pink flower to her left, and a yellow flower and an orange leaf to her right. This pin features Naveen, from the Princess and the Frog, in his green frog form. This is Minnie Mouse from the WDW Character Pop Art Style mini-pin boxed set. Minnie is wearing her classic red and white polka dot skirt and red bow. Her hands are stretched out from her body and her eyes are closed. Pin features Dale in a nerdy outfit - a blue vest, yellow shirt, and red bow tie. Dale also has black glasses. Iridessa is posing in her yellow and orange autumn attire. She is standing in front of a light pink background with a pink flower and an orange leaf on her left, and a purple leaf above her. This open stock pin is comprised of two parts: a static backplate, and a revolving frontplate with small Mickey head cutouts that reveal the flags from the backplate much like a codewheel. All the World Showcase countries' flags are represented: Mexico, Japan, Norway, China, Germany, Morocco, Italy, The United Staes, France, England and Canada. A large red Mickey icon is in the center in front of a dark blue background. Over this is the white Epcot logo. At the base of the pin is "Walt Disney World" in gold. This pin reads "Disney's Animal Kingdom" in a large box at the bottom. Above that, an elephant, dragon and dinosaur are depicted in raised, gold metallic figures. The three are marching beneath the Tree of Life against a red, orange and yellow sunset. This pin was originally released with the "Celebrate the Future Hand in Hand" backstamp. It has since been re-released each year with a new backstamp. This pin is a replica of the $.37 cent stamp released in 2004 by the United States Postal Service (USPS). This is Pinocchio and Jiminy Cricket. Pin is rectangular in shape. The border is blue with an inner border of white. We see Pinocchio's profile from his neck up. He is looking up at Jiminy Cricket in the upper left corner who is holding his opened red umbrella. Lower left corner says "37 USA." Bottom says "Friendship." The Tinker Bell pin has Tink resting her hand cheek on her hand at the top of a number 10, with the banner "Years of Pin Trading" at the bottom. This Figment pin is part of the second wave of Walt Disney World Hidden Mickeys for 2011. It shows a bright pink Figment in a dark purple square. It is number 3 of 5. This Figment pin is part of the second wave of Walt Disney World Hidden Mickeys for 2011. It shows a green Figment with purple horns in a yellow square. It is number 1 of 5. This is the silver chaser version of the Walt Disney World 2011 Hidden Mickey series- Figment Collection. The entire pin is silver and features an outline of Figment in a square. A small Hidden Mickey head icon in the bottom left portion of the square. Walt Disney World 2011 Hidden Mickey Lanyard Series - Colorful Figments Collection features Figment with a orange face/head and purple horns on a square background of pink color. A silver Hidden Mickey icon is at the lower left corner. The pin has an Andy Warhol inspired look. Walt Disney World 2011 Hidden Mickey Lanyard Series - Colorful Figment collection pin features Figment with a yellow face/head and pink horns on a square background of blue color. A silver Hidden Mickey icon is at the lower left corner. The pin has an Andy Warhol inspired look. This is for the Dopey pin. Dopey waves with his left hand. Dopey is one of the Seven Dwarfs..
Genie stands with his hands and arms out. Genie is from the film Aladdin..
Pin features Chip in a nerdy outfit - a vest, white shirt, and black tie. Chip also has black glasses. Walt Disney World 2011 Hidden Mickey Lanyard Series - Good Collection features Chip. 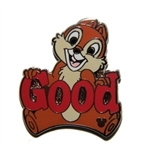 Chip is sitting down and is featured with the word "Good" in red. He has a small Hidden Mickey head icon on his leg. Walt Disney World 2011 Hidden Mickey Lanyard Series - Epcot World Showcase United Kingdom collection pin features the Hampton Court Palace at the World Showcase pavilion. The castle-like building is brown and sky is blue above. A silver Hidden Mickey is located at the bottom right of the door. 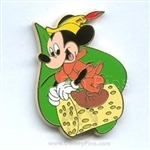 This pin is a buckeye (looks similar to that of a chestnut) shaped like Mickey's head. This looks like some of the Fruit series from Hidden Mickey Series II - it is part of a five (5) pin, Mickey food collection. Celebrate 35 years of magic at the Walt Disney World ® Resort with this Open Edition pin. This pin commemorates the 35th anniversary of Walt Disney World ® Resort and features jewel attachments. This Open Edition pin also Celebrates 35 years of magic at the Walt Disney World ® Resort. Disneyland 2011 Hidden Mickey Lanyard Series - Alice In Wonderland Comics Collection features The Queen Of Hearts in white and red colors inside a yellow rectangle. Small Hidden Mickey head icon located bottom right of the pin. Part of a mini pin boxed set. This is for the Turtle pin only. The green tortoise is facing left. 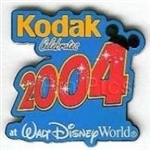 This is the EPCOT 2000 logo pin, featuring Mickey's Hands (White Gloves) holding a picture of Earth in his hands. The picture of Earth displays the word EPCOT on it. Disney Trading Pin Epcot World Showcase - Jasmine at the Morocco Pavilion. This pin features a Donald Duck cupcake. The cupcake has a white wrapper with a bow tie on it. The icing is blue with Donald's hat on it. Walt Disney World 2011 Hidden Mickey Lanyard Series - Princess Flowers collection pin features Cinderella in a blue and purple-ish flower. A silver Hidden Mickey icon is at the bottom right of the flower. This is the silver chaser Chip & Dale pin for the Walt Disney World 2011 Hidden Mickey series- Classic "D" Collection. The entire pin is silver and features Chip & Dale inside the letter "D". The number "40" is also inside the "D". A small Hidden Mickey head icon is on the bottom left side of the pin. Walt Disney World 2011 Hidden Mickey Lanyard Series - Retro Classic "D" Collection features Dewey. Dewey is inside a dark blue letter "D" with the number "40". He is wearing a blue baseball hat and a blue shirt. Small Hidden Mickey head icon located at the left of the pin. Walt Disney World 2011 Hidden Mickey Lanyard Series - Retro Classic "D" Collection features Louie. Louie is inside a dark blue letter "D" with the number "40". He is wearing a green baseball hat and a green shirt. Small Hidden Mickey head icon located at the left of the pin. This listing is for the all silver CHASER version of pin #85609. Walt Disney World 2011 Hidden Mickey Lanyard Series - Retro Classic "D" Collection features Jiminy Cricket. Jiminy is inside a dark blue letter "D" with the number "40". He is wearing a blue with gold ribbon top hat, black suit, orange vest, and yellow shirt. Small Hidden Mickey head icon located at the left of the pin. This listing is for the all silver CHASER version of pin #85564. Walt Disney World 2011 Hidden Mickey Lanyard Series - Epcot World Showcase United Kingdom (England) collection pin features a royal guard. The sentry is in a suit and a bearskin tall fur hat. He is standing inside a guardhouse. A silver Hidden Mickey is located at the bottom right of the guard shack. This pin is part of the 2011 Walt Disney World Resort Hidden Mickey Series. Disney Trading Pin Who Wants to Be a Millionaire Play It! Beginning in October 2006, Disney Cast Members and Guests at Disneyland® Resort and Walt Disney World® Resort will have a new way to create magical memories for others in the place Where Dreams Come True. Pixie Dust Pin Packs feature two Tinker Bell pins. These pins are presented spontaneously by Cast Members to Guests who are observed performing random acts of magic for others at Disney Parks. Once awarded a Pixie Dust Pin Pack, Guests are invited to keep one pin and share the second pin with another Guest they see creating magic. This open edition pin features Pinocchio on a Vinylmation™ form. The Pin is mostly square with a black border or frame around the outside. Mickey is featured leaning his left elbow on the border with his head leaning on his left hand. Mickey's right hand is also resting on the border. The background is red with yellow Mickey icons. The Pin is mostly square with a Brown (or deep purple) border or frame around the outside. Pluto is featured leaning on the border with both his paws, Ears up and smiling wide. The background is Green with White Bones. Pluto is wearing a green collar. Tinker Bell flying away. She is flying away from the viewer but has her head turned back to smile at the viewer. She has a blue ribbon in her hair and is smiling. his open edition mystery collection features Mickey Mouse in various artistic styles. 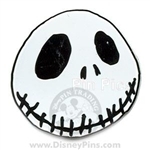 This round pin shows just Jack's white, skull-like head and face. He is smiling and his stitched-closed grin goes half-way up the sides of the pin. This silver-finished pin is done in pastel colors with a glittery light-blue cloud background. Tink has glitter in her wings. There are blue stars around the cloud. Dark purple square pin with Figment's face (light purple, with bright orange horns and bright yellow eyes). Underneath it says "CONFUSED". Fairy club penguin is yellow, wearing a pink and purple fairy outfit, and holding a yellow sceptre with a star on top. She is quite beautiful. Pin features Minnie Mouse in a nerdy pink dress outfit, black tie, pink bow, and pink glasses. Pete is dressed as Boba Fett in a scene from Star Wars TM: Episode V - Empire Strikes Back. This pin is part of the Star Wars TM Mystery Pin Collection. This listing is for the Mad Hatter pin from the open edition Alice in Wonderland mystery collection (#88550). This open edition mystery collection features Mickey Mouse in various artistic styles. This pin design shows the Mad Hatter. This open edition mystery collection features Mickey Mouse in various artistic styles. This pin design shows the Caterpillar. Tinker Bell as a toddler/baby. She is crossing her arms across her chest, and is smiling. This cute Tinker Bell pin, features baby Tinker Bell sitting cross-legged. She is smiling while looking to her right and she has a blue ribbon in her hair. This open edition mystery collection features Mickey Mouse in various artistic styles. This pin design shows Executioner in Vinylmation form. This license plate represents the Expedition Everest® Attraction. The orange and tan deer is jumping/leaping/bounding to the left. It has a brown nose, and brown antlers and hooves. This mini-pin boxed set features the virtual prizes won by guests at Toy Story Midway Mania at Disney's California Adventure™ Park in Disneyland® Resort, and Disney's Hollywood Studios™ in Walt Disney World® Resort. This open edition pin features the Muppets Statler on a Vinylmation™ form. This is the Disney's Yacht Club Resort pin from the Disney Resorts collection of 2010 Hidden Mickey Pins at WDW. This pin features a Hidden Mickey found on a pillow from the Disney's Yacht Club Resort. This collection of Vinylmation™ pins features many popular designs from Vinylmation™ Figures. The pins are sculpted to give a three-dimensional look. 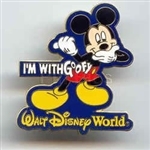 This pin includes a design from Park #1 which features a red Walt Disney World Monorail. Disneyland 2012 Hidden Mickey Lanyard Series - Fantasyland Icons collection pin features the Storybookland Canal Boats attraction Lighthouse. This pin features a red and white lighthouse with a blue banner that reads "Storybookland". A silver Hidden Mickey icon is at the bottom of the pin. Mickey Mouse strikes an uncanny resemblance to the infamous Captain Jack Sparrow. He is wearing a pirate outfit and has a moustache. Pin features Minnie Mouse's head. Minnie is wearing a pink bow, pink glasses, and a black tie. This five (5) pin collection the outlines of different Disney Character faces. 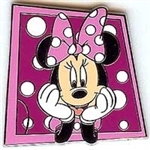 This pin features the outline of Minnie's face on a blue background. This five (5) pin collection features iconic designs found on Walt Disney World® Theme Park maps. This pin features the icon for Character Meet locations. Disney Trading Pin Hidden Mickey Pin Series III - Dog With Mouse Ears This pin features a stylized dog wearing a Mickey Mouse Ear Hat. It is part of a five (5) pin Pets with Mouse Ears collection. 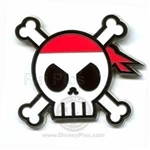 This pin features angry Donald Duck dressed in a pirate outfit. Goofy is dressed in a Davy Jones costume. This listing is for the Constance pin from the open edition Haunted Mansion mystery collection (#86808). This listing is for the King Ghost pin from the open edition Haunted Mansion mystery collection (#86808). This open edition mystery collection features Mickey Mouse in various artistic styles. This pin design shows King Ghost in Vinylmation form. This listing is for the Grecian Ghost pin from the open edition Haunted Mansion mystery collection (#86808). This pin features Daisy Duck standing with her hands on her hips. She is wearing a blue beach dress, bow, blue sunglasses, and purple sandals. This pin features a pink puffle from the Disney Club Penguin booster set. He is pink and has a smile on his face. Presenting a most sensational, celebrational, muppetational mini-pin boxed set featuring the Muppets wearing Mickey Mouse ears. The pins feature the faces of the Muppets with black Mickey Ears caps/hats on their heads. Part of Pin Set #62491. This is for the Bear pin only. The bear has sharp white teeth and is standing on its hind legs, hunched over. Part of Pin Set #62491. This is for the Cat pin only. The cat is golden-yellow with brown stripes/markings, facing left. This is Donald Duck from the WDW Character Pop Art Style mini-pin boxed set (#70033). This is Daisy Duck from the WDW Character Pop Art Style mini-pin boxed set (#70033). 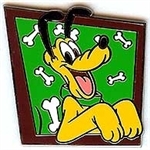 Pin features Goofy's head. Goofy is wearing his green hat, orange glasses, and a green tie. This listing is for the Stitch pin from the open edition "Nerds Rock!" Head Collection (#90174). This is the Donald Duck at the Sorcerer's Hat pin only from set #78643. The world famous Disney characters enjoy the attractions of Walt Disney World Resort in this deluxe starter set. This set contains a lanyard with special lanyard card and eight pins featuring various Disney attractions. Pluto is seen happily sitting outside the store with his blue shopping bag. I wonder what he got! This pin collection featuring the Disney characters on guitars is sure to strike a chord with your pin collection. 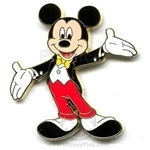 This pin features Mickey Mouse with a rainbow. 2010 Hidden Mickey Lanyard Series - Country Bears Collection features Teddi Barra. Small Hidden Mickey head icon located to the bottom right of the pin. 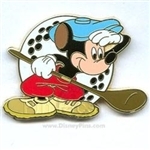 This listing is for the Mickey Ear Hat pin only from the open edition 2011 Mini Pin Collection (#81368). This Pin Features "Oswald the Lucky Rabbit" (also known as Oswald the Rabbit or Oswald Rabbit) He is an anthropomorphic rabbit and animated cartoon character created by Ub Iwerks and Walt Disney for films distributed by Universal Pictures in the 1920s and 1930s. He and Mickey do share the same creator and Mickey is closely based off of Oswald's looks and Oswald is believed to be Mickey's older half-brother (even though Walt had never stated their relationship). This was given out between 8/1/01 - 10/8/01 at the Disney Store when a guest pre-ordered a Snow White and the Seven Dwarves DVD. It pictures the 7 (seven) dwarfs (dwarves) all squished together in a frame. This listing is for the Venus Flytrap Vinylmation pin from the open edition Vinylmation Jr. Series #1 mystery collection (#80621). These Vinylmation Jr pins are approximately 1.25" tall. On this pin, Cinderella commemorates her newest Walt Disney World® stage show, Cinderellabration, filled with sparkling pageantry and starring just about all the beloved Disney princesses. Cinderella is dresed in a white gown in front of her blue castle. Background is light blue with small golden starbursts. Blue banner towards the bottom reads "Happiest Celebration on Earth Disney Parks and Resorts." 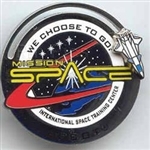 To collect this pin, look for specially marked Energizer® AA-8 pack of batteries at local retail stores now. Inside the battery pack you will receive one FREE commemorative pin. Be sure to collect all 5 Disney Parks pins and join in the fun of the biggest celebration in Disney history. On this pin, Tinker Bell soars over Disneyland® Resort in a tribute to 50 years as part of the dazzling "Remember ... Dreams Come True" E-ticket in the sky spectacular. Sleeping Beauty castle is on this pin with multi-colored fireworks and small golden starbursts on the light blue background. Blue banner towards the bottom reads "Happiest Celebration on Earth Disney Parks and Resorts." To collect this pin, look for specially marked Energizer® AA-8 pack of batteries at local retail stores now. Inside the battery pack you will receive one FREE commemorative pin. Be sure to collect all 5 Disney Parks pins and join in the fun of the biggest celebration in Disney history. Disney Trading Pin Tinker Bell Pin Trading Lanyard Set (Tink! on the Left). This pin is one of four pins(two different poses) of Tinker Bell on a pin trading starter lanyard. It features our favorite pixie, posing, coyly, with her hand behind her head. She is centered in a purple, glittering star with one, glittering, yellow star on either side of her. Beneath, to the left, her nickname, "tink! ", is written in yellow. Fourth release in the Pixie Dust Series. 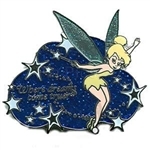 Pin features Tinker Bell (of "Peter Pan") flying beneath a blue glitter-filled cloud surrounded by stars. Tink is waving a wand which is leaving its own trail of pixie dust. The words "Where Dreams Come True" are written in the upper right of the pin. Back of pin is stamped the same as the other pins in the set. Pin usually comes in sets on two, one to keep and one to share the magic. This entry is for one pin only. This pin was given out in a sealed bag on a card. The card reads "Where dreams come true" (the pin is in the middle followed by) "Just wanted to spread the magic by giving you this exclusive Pixie Dust pin. After all, this is the place Where dreams come true." This is the SMRT-1 pin from the Past Attractions collection of 2010 Hidden Mickey Pins at WDW. SMRT-1 was the robot featured in Communicore at Epcot, which was replaced by Innoventions. This pin will only be available by trading with a cast member. You had to collect "Virtual Pins" and print out a certificate from WDW.com in order to be eligible to receive this free pin. Blue oval DVC logo with gold Mickey ears rising over purple mountains; "Disney Vacation Club 2000"; "A magical tradition... a brilliant future". Someone told me that only 60 of these get released per day, and they will run out before the 15-month Millennium celebration ends. 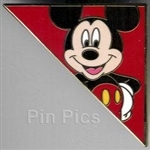 It is part of a four-pin, Disney Pin Trading Logo Collection. This pin has a backstamp that says "2 of 4" and will debut at Disney's Pin Celebration 2007. This Hidden Mickey Pin features Figment. It is part of a four-pin Figment Collection. Mickey Mouse is dressed in his pirate attire. Mickey is wearing brown boots, blue pants, tan sash around his waist, and a black coat. In his right hand he is holding a sword. On Mickey's head he is wearing a burgundy bandana and on top of that he has on a brown hat with a white skull and crossbones in the center. Behind Mickey is a cannon and some cannon balls. Disney Trading Pin 100 Years of Magic Walt Disney World (Fab 4 Painting). Cute Lilo from Lilo & Stitch Starter Lanyard set #24682. Pin shows Lilo with name and flower. Pin size is 1 1/2 inches by 1 3/4 inches. Has (various years) pin trading logo on reverse.